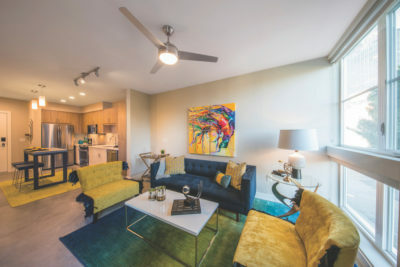 MODEL APARTMENT at Desmond at Wilshire. Urban living has never been better with several choices in the offing on famed Wilshire Boulevard. Desmond at Wilshire offers an oasis in the bustling city. 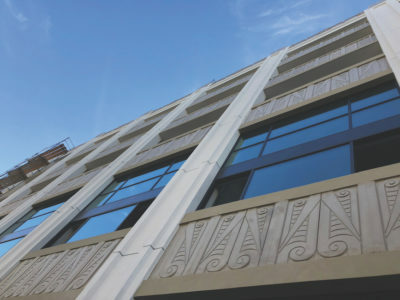 The new seven-story building has modern touches throughout yet evokes its Art Deco past. It is located behind the legendary 1929 Desmond’s Tower, at 5520 Wilshire. The 175 studio, one- and two-bedroom apartments feature floor-to-ceiling window walls. Select units have balconies and decks, lofts and views of downtown and the Hollywood Hills. DESMOND floor plan for a two-bedroom, two-bath unit. Amenities include quartz countertops with glass mosaic backsplash, porcelain tile and hardwood-style plank floors, stainless steel Energy Star appliances and keyless entry. A resort-style pool has an outdoor TV lounge. A fireplace and a rooftop deck add to the five-star experience, said Lauren Ellison, manager, national marketing. Most pets are welcome at the site opened in 2016. 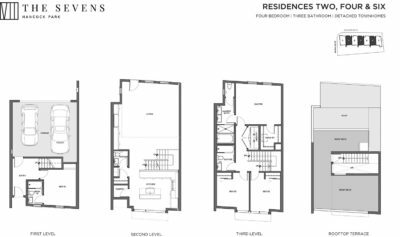 THE SEVENS has four levels per residence. A collection of seven small lot, single-family dwellings at 4701 Wilshire Blvd., dubbed The Sevens, has garnered much interest from the community. After the Chronicle’s first article last July, the real estate brokers tell us they received requests for information from 400 qualified buyers. The north-south oriented homes have a modern “New York brownstone” feel to them. The space is vertical and light. 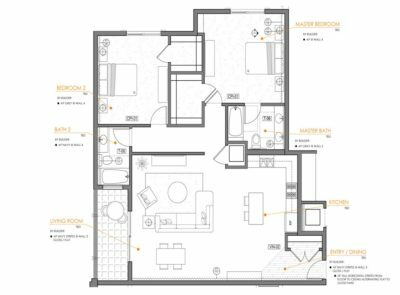 Residence VII has three bedrooms, while the others have four, but they all vary slightly in layout as well as size, ranging from 2,166 to 2,429 square feet. LIVING ROOM at The Sevens. Each detached residence has Viking appliances, white oak flooring, four bathrooms, high ceilings, a rooftop terrace, filtered skylights, the capacity for solar paneling and a two-car garage with pre-wiring for an electric vehicle charger. There will be an open house for neighbors, as well as an evening event in the future, says representative Diana Knox. PARAPETS and geometric patterns add touch of history at Mansfield, at the site of the former Four Star Theatre. Residents and their guests will enter under a theater marquee at The Mansfield when it opens in June. The Mansfield architecture also mixes the area’s Art Deco past with the new at the 138-unit, mixed-use apartment building at 5100 Wilshire Blvd. — at Mansfield Ave. In homage to the Four Star Theatre, which opened at this location in 1932, the lobby décor includes photos and murals of movie premieres held there, said developer Aaron Korda of the Korda Group. Other touches are geometric parapets on the building, a fountain with custom tiling, and balconies with stone façades. Two floors of the six-story building feature lofts with 18-foot ceilings. 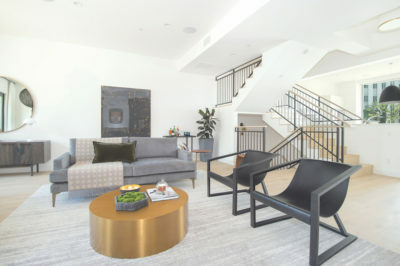 Amenities at the complex include private balconies, a pool and Jacuzzi, fire pits, a gym, clubhouse, outdoor movie theater and spacious decks with views of downtown and the Hollywood Hills. An Automobile Club of Southern California office and a yoga studio will be on the ground floor, Korda said. 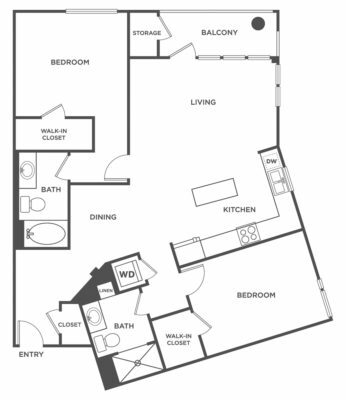 FLOOR PLAN of a two-bedroom apartment at The Mansfield. The original movie theater will be memorialized in the project breezeway by three murals by artist Jeanine Hattas. Based on historic photos, painted on canvas and applied to the concrete walls, the largest, 34’x13’, shows crowds at a 1939 movie premiere attended by the Keystone Cops, Mr. and Mrs. Darryl Zanuck and Joan Crawford. Three framed art pieces from the 900-seat theater will hang in the main lobby. The Four Star was one of several theaters commissioned by United Artists and Fox West Coast Theatres and was designed by the firm of Walker and Eisen, with Clifford Balch as architect, according to the Los Angeles Conservancy. The former movie house featured Art Deco details including inscribed chevrons, stripes, and abstract figurative and floral motifs, as well as a central tower that rose in a series of staggered steps. Rachel Olivier contributed to this article.